Rohingya people are a Muslim minority group residing in the Rakhine state of Myanmar, formerly known as Arakan and are considered to be a variation of the Sunni community of Muslims. The Rohingya people are considered “stateless entities”, as the Myanmar government has been refusing to recognise them as one of the ethnic groups of the country. 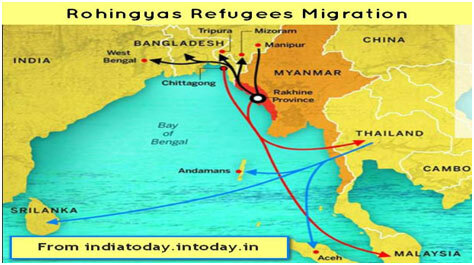 In Myanmar Rohangiya’s known be as Bengalis For this reason, the Rohingya people lack legal protection from the Government of Myanmar, are regarded as mere refugees from Bangladesh, and face strong hostility in the country. As per the United Nations refugee agency, in a span of last two weeks, almost 300,000 Rohingya have crossed over to Bangladesh from the northern Rakhine state in Myanmar, putting Bangladesh under immense strain and compelling the refugees to find shelter in filthy, unsanitary camps scattered along the Myanmar-Bangladesh border. The latest surge follows attacks on police posts by an extremist Rohingya group, ArakanRohingya Salvation Army(ARSA),in late August this year and military action. While the Myanmar authorities claim that 400 lives have been lost, advocates cite double this number. Who are the Rohingya Muslims & how the problem started? Since the Rohingya are considered to be illegal Bengali immigrants and were denied recognition as a religion by the government of Myanmar, the dominant group, the Rakhine, rejects the label “Rohingya” and have started to persecute the Rohingya. Nearly 90% of Myanmar’s population is Buddhist, and only 4.3% is Muslim. In Rakhine State, however, Muslims comprise nearly half of the population. The 1982 Citizenship Law denies the Rohingya Muslims citizenship despite the people living there for generations. The Rohingya are fleeing Myanmar because of the restrictions and policies placed by the government. The restrictions include: “marriage, family planning, employment, education, religious choice, and freedom of movement” and they are facing discrimination because of their ethnic heritage. For years the Rohingyas have faced discrimination and persecution, today they are still facing this problem and have started to flee to other countries for safe haven. Myanmar does not recognize the Rohingya, preferring to refer to them as Bengali, which suggests they are from neighbouring Bangladesh. Apart from impinging upon Myanmar’s internal security, the Rohingya crisis is also posing a security challenge to the South and Southeast Asia. Although ARSA has reportedly denied any connection with the IS, suspicions persist about linkages between the two groups. An ARSA leader mentioned that they are fighting to stop the state-led oppression against the Rohingyas in Myanmar and get citizenship rights to them. The systematic deprivation and gross violations of basic human rights have forced Rohingyas to flee their native land and seek refuge in neighbouring states including Bangladesh, Indonesia, Thailand, Malaysia and India. They have been unable to rebuild their lives in most of these countries due to the lack of opportunities provided by the host nations to contribute to the economy of that country even through semi-skilled and unskilled labour work as well, due to the growing fear of their linkages with Islamic extremism. The economic burden emanating from the huge refugee influx, the growing fear of linkages between the Rohingyas and the IS, coupled with the apathy of the countries of the region towards the problem, explains the stance of the ASEAN countries in advocating a domestic solution to the crisis. India called for restraint on the part of the Myanmar government to end the violence in Rakhine state – days after New Delhi dissociated itself from a joint statement by the Bali Declaration adopted at the World Parliamentary Forum on Sustainable Development held at Nusa Dua in Indonesia that included a reference to human rights in Myanmar. The Bali Declaration, which was joined by India’s neighbours Bangladesh, Bhutan, Nepal, Afghanistan, Pakistan and Sri Lanka, had expressed concern about the violence in Myanmar’s Rakhine state, where the UN says at least 1,000 Rohingya Muslims have been killed, and 300,000 have fled to Bangladesh in the past two weeks. The declaration had called on all parties to contribute to the restoration of stability and security, exercise maximum self-restraint from using violent means, respect the human rights of all people in Rakhine State regardless of their faith and ethnicity, as “there can be no sustainable development without peace”. During Prime Minister’s recent visit to Myanmar, he had expressed his concern at the casualties of security forces as well as other innocent lives. He had also urged a solution based on respect for peace, communal harmony, justice, dignity, and democratic values. India also offered development assistance in Rakhine in cooperation with the Myanmar government. Prime Minister in a joint address to the media in NaiPyi Taw with Myanmar State Counsellor, said that India shared Myanmar’s concerns over the Rakhine situation but did not mention anything about alleged human rights violations against the Rohingyas, tens of thousands of who have fled to neighbouring Bangladesh, with many thousands spilling over to India. We are partners in your concerns over the loss of lives of security forces and innocent people due to the extremist violence in Rakhine state, he said. The government has said it would deport all Rohingyas living in India illegallybut the Supreme Court has said that it will hear a plea seeking a direction to the central government not to deport about 40,000 such refugees back to Myanmar. India’s tough stand on deporting Rohingyas back to Rakhine State in the midst of the ongoing violence has evoked criticism from national and international human rights activists. The statelessness of the Rohingyas and the lack of empathy towards the plight of the Rohingyas have contributed to the adoption of extremist methods by them. If not addressed pragmatically, the Rohingya crisis will only cause more violence, leading to more refugees and chronic instability in the region. ASEAN, India and Bangladesh need to discuss the Rohingya crisis together to work for an optimum solution to the problem. 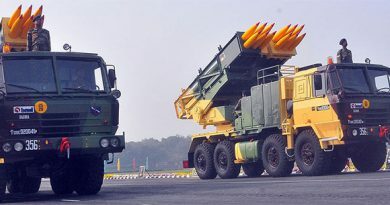 The first step would be to convince the present government in Myanmar about the benefits of well-coordinated cooperation between ASEAN members, India and Bangladesh to tackle the issue. The platforms of the regional and sub-regional institutions including ASEAN Regional Forum (ARF) and the Bay of Bengal Initiative for Multi-Sectoral, Technical and Economic Cooperation (BIMSTEC) need to be more effectively usedto discuss the issue openly and take advantages of the experience of countries like India and Thailand who have long experience in dealing with insurgency and terrorism. Here, ASEAN needs to push aside the principle of non-interference in the internal affairs of a member country as the Rohingya crisis is not a one-country problem.